I did this challenge last year and I had loads of fun so I thought about sharing the experience this year! I love reading series, but sometimes we priorize stand-alones or we just start other series or forget about the ones we have started. Why? That’s a mystery sometimes. I would like to thank Karla @ Reads and Thoughts, for encouraging me to do this. 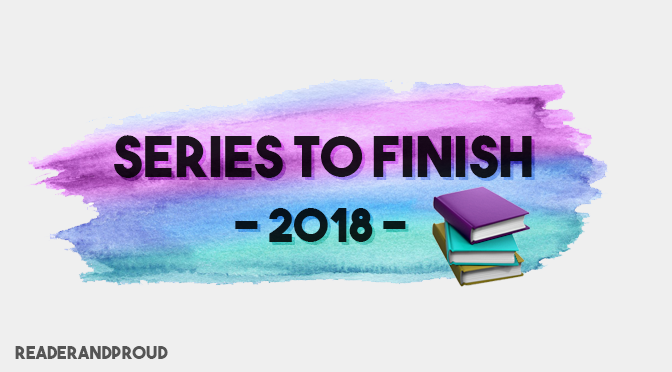 Would you like to join me in finishing some series in 2018? The goal for the challenge is to complete series; it does not matter if you only have one book left or ten, the important thing is to finish them. 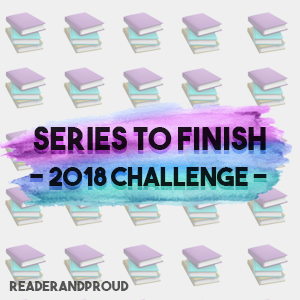 Similarly, the amount of series you’re aiming to finish is not important; I’d like this challenge to be as chill as possible so as long as you try to read and complete more series, you’re already a winner! The challenge will run from January 1st to December 31st and you can join at any point. ARCs do count for the challenge, as well as books published in 2018. I believe that an important part of reading is discussing those books with other people, so with that in mind, I created a spreadsheet where I will be writing the series people have added to their TBRs. However, I will only add your choices as long as you want me to. ⭐ The aim of the spreadsheet is to find other people that want to (or have) read the same series as you and discuss those books, or even do a buddy read! ⭐ If you want to share the books you’re reading, please tell me, or add them yourself in this spreadsheet (I know I have two different documents, but since this is voluntary I did not want to put it together). Are you in? Will you join me? omg Anna this on end of my main goals for 2018!! I AM SO IN!!! I love this. I have a post planned about series I want to finish so I’ll definitely be incorporating this into that post!!! I said that last year, made the challenge for me and it helped me a lot so I hope the same goes for you! Consider it done ♥ I’ll try and have it finished today, but if not it’ll definitely be within a couple of days (just depends how demanding my siblings are being haha). and I also made a little badge graphic here: https://wonderlessreviews.files.wordpress.com/2017/12/seriestofinishbadge.png in case people want to put on their blogs that they’re taking part in the challenge!! LAUREEEEEEEEEEEEEEEEEEEEEEN. OMG, THANK YOU SO MUCH. REALLY, I HAVE NO WORDS. I am adding those right now! Really? I’m so happy to hear that! I also want to priorize that 🙂 Hopefully you’re able to join and finish some series whilst having a lot of time, Arya! Wow, thank you Ruby! I’m gonna head over to your blog now to check it out and add you to the list of parrticipants if that’s okay with you. I feel better knowing I’m not the only one that need to work on series. And I’m also scared of those last books, they can be so intimidating! I definitely will bring doing this. I have a couple series to finish – the first one being the Harry Potter series. That is awesome, thank you so much! I just needed an excuse to work on my series hahahaha And good choice with Harry Potter; is it your first time? I will keep an eye out if you ever post a TBR for it 😉 I’m always curious about everybody’s options. You can never be late to any book party 😉 I have never tried the HP audiobooks but I’ve heard good things. I understand not having read them before, having the movies too. I hope that by reading them your experience is better and you get to enjoy them! The audiobooks were amazing! However, since I had gone too fast through them, I missed out on a lot. You always discover new things when rereading them 😉 You’re in for a fantastic ride!